It’s always a good thing when progress in endometriosis research gets into the public eye and the previous weeks have been just such a time. Many of you will have already seen the reports on sites such as here and here and, like me, are excited about where this new research will lead. I remember reading about the announcement of this research project and the establishment of the MIT Centre for Gynepathology Research way back when it first started in 2009. I was particularly impressed by the fact that research was being conducted at MIT, one of the most prestigious research centres in the world. The research group is being headed up by Professor Linda Griffith, who you may or may not know was part of the team that created the mouse with a human ear on its back that was all over the newspapers in the late 90’s. Prof Griffith has had quite the illustrious career, decorated with numerous awards (including the MacAuthur genius grant, which as the name suggests, is not handed out to just anyone), but it was the experiences of her teenage niece with endometriosis that brought home the dire need for better understanding of the disease and reproductive health in general. So, she and her collaborators established the MIT Centre for Gynepathology Research and have been busy ever since trying to pick apart this disease we call endo. Now the fruits of their labour are being harvested and it’s time to see what impact this will have and where this can take us in the future. Given the prestige associated with this research group it is unsurprising that this article is a tour de force of endometriosis research, which should be held aloft as a shining example of how science is meant to be done. What do I mean by that? Well ideally any investigative research should tell a story, almost like a crime novel. There should be a beginning, where the problem is established and suspects identified. A middle, were the suspects are narrowed down and the evidence against them investigated. And an end, where the culprit is identified and the motives discussed. So then, let us read this article as if the researchers were detectives and we’re accompanying them as they try to solve a tricky case. The crime? Aiding and abetting endometriosis. Please read this rest of this post in the voice of a grizzled, old detective, ideally in a darkened office with a cigar in one hand and glass of whiskey in the other, melancholic jazz music playing in the background. We arrive then at the crime scene, a strangely familiar place I recall from pictures I feel I’ve seen a hundred times, I’m informed it’s the peritoneal environment, the area inside the pelvis where endometriosis is normally found. What could’ve caused endometriosis here? Hmm that’s a tough question, perhaps better suited for another time, but it seems endometriosis had an accomplice; something was helping endometriosis cause suffering. The signs point to inflammation, it’s known to cause pain and may even contribute to sub-fertility, there are so many factors that cause inflammation though this is going to be a tough case, but we’ve got to start somewhere. I know what you’re thinking, why not just stop inflammation, there are drugs out there that can do that. The detective points out there have been several studies and trials in animals looking at drugs that reduce inflammation. However, in animal studies although you can measure if certain drugs reduce the growth of endometriosis, you can’t measure factors like pain symptoms, infertility or disease recurrence, which are far more relevant to women with the disease. Speaking of which, time to see what the victims have to tell us in all this. 57 women with endometriosis were recruited for this investigation (who were divided into two groups based on whether they were taking treatment or not) and 20 women undergoing surgery who were found not to have endometriosis (called the controls). Looking at the information collected on the women might give us some clues. For example, women with endometriosis (either treated or untreated) had significantly higher occurrences of dysmenorrhea, dyspareunia and pelvic pain than controls, even though the majority of the control women had leiomyoma (fibroids). Nothing much new there, we knew endometriosis was a real piece of work, wouldn’t hesitate to kick you when you were down. Perhaps we need to look at the crime scene again, there’s seem to be some sort of puddle in here, ah yes, it’s the peritoneal fluid. Peritoneal fluid is basically just the liquid inside the pelvic cavity where all your reproductive organs are, but it can hold all sorts of clues. The detectives took the peritoneal fluid away for analysis, when they came back they told us although the amount of fluid didn’t vary much (less fluid was seen in women with endometriosis of the rectovaginal cul-de-sac and ovaries), the number of leukocytes was much, much higher in women with endometriosis regardless of whether they were receiving treatment or not. Leukocytes (pronounced loo-co-sites) aka white blood cells, they’re an important part of the immune system, usually the good guys, helping to fight off infection and remove harmful material from the body. Were they just witnesses or were they hiding something? The thing about white blood cells is they have a number of appearances, each with their own particular skills and talents in keeping the immune system running. The fact that there seems to be an excess of these cells in the peritoneal fluid of women with endometriosis makes it look like they were trying to help fight the endometriosis, maybe it’s all just a front. The detectives investigating this case needed to identify some specific factors that are linked to symptom severity, they needed to name some names. 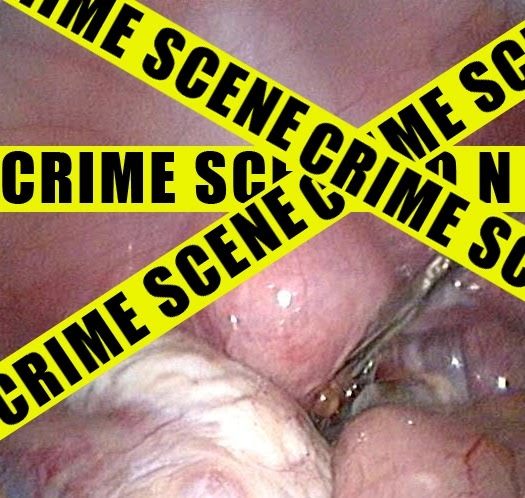 A crime like endometriosis, it’s got chronic inflammation written all over it. Time to line some punks up against the wall and get them to talk. The prime suspects are factors produced by the body that could cause inflammation, such as cytokines, chemokines and growth factors. So the peritoneal fluid was collected and the levels of 50 different inflammatory factors within it were analysed. If any of these factors were found to be elevated in women with endometriosis that’d be the first list of suspects. It might even tell us who was responsible for helping endometriosis cause so much suffering. So did they find any increase? Yeh they did. Of the fifty different factors, ten were found to be associated with endometriosis. Further analysis showed that five of these factors were elevated in women with stage III/IV disease, although no specific factors were found to be associated with stage I/II disease. Things were looking promising, the case was going well, but assessing endometriosis by stage doesn’t make things easy when it comes to identifying factors that relate to symptoms, mainly because the stage of endometriosis you have isn’t really related to what symptoms you get, endometriosis is tricky like that. Fortunately the detectives knew a way around this; they split the samples from untreated women with endometriosis into two groups. One group whose pattern of inflammatory factors was very similar to controls and another group who had at least four factors which were significantly different from controls. What they found was a collection of thirteen factors, a ‘fingerprint’ of increased inflammation associated with severe presentations of endometriosis with reduced fertility - looks like they had a breakthrough that could blow this case wide open. Unfortunately they weren’t able to find any fingerprints associated with any specific type of endometriosis (peritoneal/ovarian/deeply infiltrating) or associated with any specific symptom. This could’ve been down to the number/age of women investigated or the fact that most of the controls (i.e. the women they were comparing to endometriosis patients) had fibroids. That was a problem for another day though, other investigations could be carried out in the future with more women, the important thing was the fingerprint had been found, now it was time to see who matched. Something about those leukocytes we came across earlier didn’t feel right, the detectives thought so too. After running the fingerprint against different kinds of leukocytes, they got a hit. The finger was pointed squarely at the big eaters, aka macrophages. Like the other leukocytes macrophages were normally the good guys, it was their job to destroy diseased or infected cells, by engulfing and digesting them and to signal other immune cells to come join the party. Turns out this isn’t the first time macrophages have been the prime suspect. They are seen to be very important in endometriosis; they’re just a bit screwed up though. Looking over the notes from another case it turns out they hate endometriosis too, they react to the disease as if it were a wound, trying to do their job and ‘fix’ the injury but end up secreting factors that actually encourage the survival of endometriosis instead. Kinda like trying to put out a bonfire with petrol. Is that the end of the case though? Should we just lock up the macrophages and throw away the key? Maybe there’s more going on here, macrophages are trying to be the good guys, but something is telling macrophages to produces these inflammatory factors that help endometriosis - the detectives think it’s time to look even deeper into this mystery. Within the cells of your body there are all sorts of different signals that tell a cell what to do and how to do it. Amongst these signals are ones that switch on genes and one such signalling mechanism, called the JNK signalling pathway, was found to be responsible for the inflammatory activity of macrophages. So the true culprit has been found, case closed? Not quite, endometriosis has many different accomplices and although one of the major ones has been identified there is still much work to do. Damn, and I was only two days away from retirement. Now we’ve got to the end of this story, if we run the story in reverse, we can see how this could lead to new treatments for endo. For example, if a drug is developed to inhibit the JNK signalling pathway in macrophages in the peritoneum, this will stop the macrophages producing the inflammatory factors that are associated with endometriosis which may reduce symptoms or shrink the disease. Although I have pointed out the limitations of animal studies earlier they still have some use. For example, using mice, other researchers have already shown that inhibiting this JNK signalling pathway reduces the growth of endometriosis (interestingly this treatment did not seem to alter hormone action). Whether or not this will lead to better treatments in humans remains to be seen, however it is certainly a great leap in the right direction.